It’s no secret I have a love obsession with J.Crew. We also know it’s no secret that J.Crew Factory has the best deals offered from the company. However, I don’t shop the factory as often as I should being that the online access is limited to weekends. I was SOOO excited to receive an email about “a new J.Crew Factory” open online, all day. everyday. As I was browsing the new site, I noticed that there are a lot of similar (almost identical) items offered that I’ve worn in past personal style posts (some recent, some from almost a year ago). So here it is, a second chance at styles that are a steal of a deal!! I love J Crew and these are some great choices!! I want the scarf and polka dot skirt! Love your choices! I too love their Factory! I actually have their cheetah print belt and I swear I wear it nearly every day. could that teal coat be more better! I need to swing by JCREW and get that coat. It’s beautiful. The dress coat looks very beautiful. Love it. 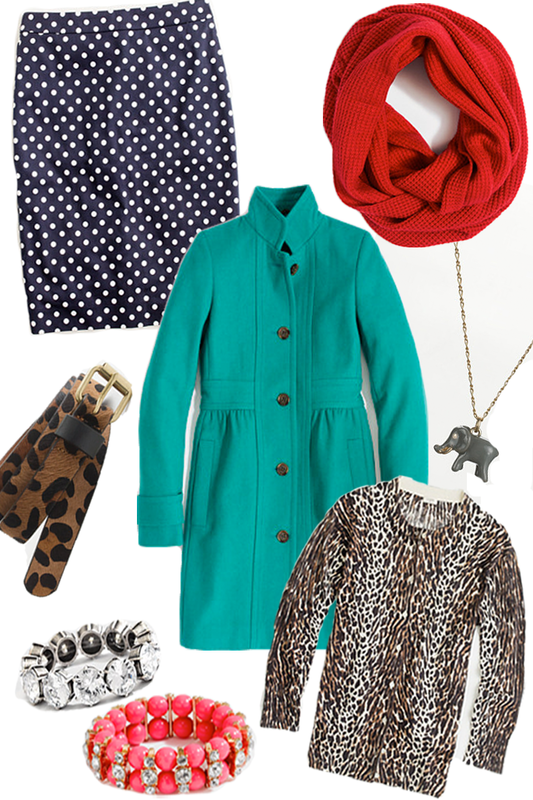 I love that J.Crew opened their factory outlet online – brilliant! Beautiful clothes! I cannot wait to go shopping. J. Crew Factory, here I come! Love the leopard crewneck! I’m also excited about the factory online – yayay! Thanks for the heads up! Will have to go check it out!! JCrew factory online has been open all days of the week for quite some time now. SO EXCITING! Can’t wait to check it out! Yay! Just what I need! Thanks Rach! Yay! Just what I needed! Thanks Rach! I love “duplicating” their looks for less like my post today shows. This way I can actually HAVE their looks for less. Thanks for sharing! I am so excited about the new Jcrew Factory site! I am never able to get to the actual store. Love these pieces! Wahoo! Thanks for the heads up. Our first J. Crew is opening here in Albuquerque, NM in just a few short weeks! I. Can’t. Wait. Guilt free shopping adds up, but boy do I love me some factory shopping! Great idea for a post! Wow! Such cute items. Love the bracelets and teal coat! Love when I can find their clothes at a thrift store. Thank you for the suggestions. I just bought the pink elastic bracelet! I LOVE this outfit. Excited to go take a looker at this! Who isn’t obsessed with J. Crew?! They are incredible, and the factory store is perfect for a college girl like me! Thanks for sharing your favorites! I am about to order the pink bracelet! Love this post. I think i’m going to have to get the polka dot pencil skirt. Gorgeous!!!! I’ve been shopping at the factory store for a while now. One of my favs. Love it! There is a factory store near my house and I love it! Oh my gosh I want all of these things. Thanks for sharing the site! I love everything J.Crew and I NEED those bracelets!! Loving the leopard print & the jewelry! J.Crew factory store here I come!